I walked in the door to an invitation to come straight to the kitchen to sit down. Morgan and Roger had prepared dinner for me. The table was set; the water glasses were full; ranch chicken, mashed potatoes, green beans and rolls were waiting for me. What a wonderful welcome! It was like heaven on earth. I didn’t have to do anything except sit down and enjoy what those two had prepared for me. What a gift it was! Jesus gives us the same invitation only instead of food, it is eternity in the real heaven. We come just as we are. It doesn’t matter what we’ve done, where we’ve been or who we were with. He just wants us to come to His table and dine with Him. He’s done all the work for us. It truly is a gift. 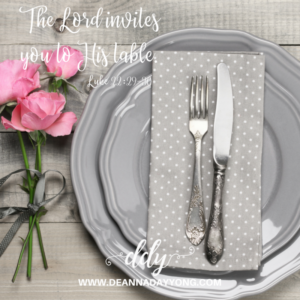 Accept the invitation and you can dine with Christ in heaven for eternity. You can talk to Him day and night and He will be with you every moment from right now and forever in eternity helping you through each day. Dinner’s ready. Will you join us? This entry was posted on December 30, 2017 with tags: #makeadifferenceeveryday, christian, faith, Jesus by Deanna Young.